During Word Work, students experiment with spelling patterns, memorize high-frequency words, and develop a genuine curiosity for and interest in new and unique words. By playing with words, word patterns, word families, prefixes, suffixes, and so on, students hone their knowledge of words and increase their speaking and writing skills. Foundation lessons provide students with prerequisite skills and knowledge so that the Word Work launch goes smoothly and successfully. Select a topic below to browse supportive resources. A consistent variety of materials produce engaging and enjoyable practice opportunities so students can discover spelling patterns and words. Includes information on setup, cleanup, organization and storage. Videos, lessons, and articles come together to guarantee a joyful and successful launch using the 10 Steps to Teaching and Learning Independence. 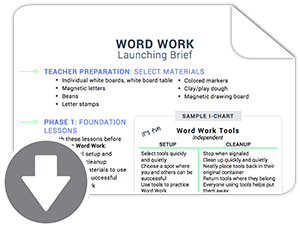 This one-page guide will help you remember what foundation lessons to teach before launching Word Work and what essential behaviors need to be placed on the I-chart.